One of my managed sites recently became interested in tracking button clicks out to an external scheduling service. There were various “Schedule Now” buttons through out our site, and we thought tracking these clicks might helps up learn how many users were clicking through our site when creating appointments. We were already using Google Analytics to monitor simple things like page views, referral traffic, and search queries. 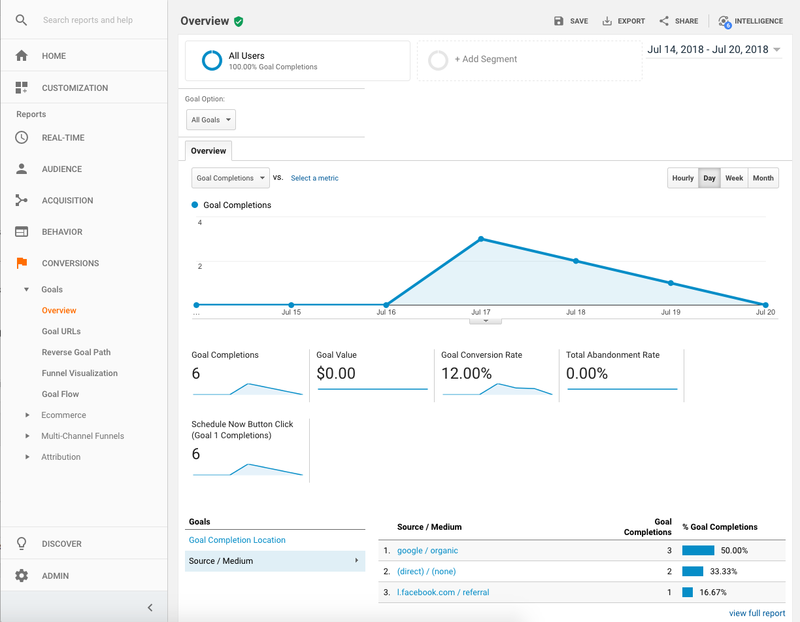 With Goals, it was straight forward to configure Google Analytics to track our “Schedule Now” button clicks, and then view reports summarizing clicks against different dimensions like time or Referral/Source (e.g. Organic Search, Paid Search, etc.). 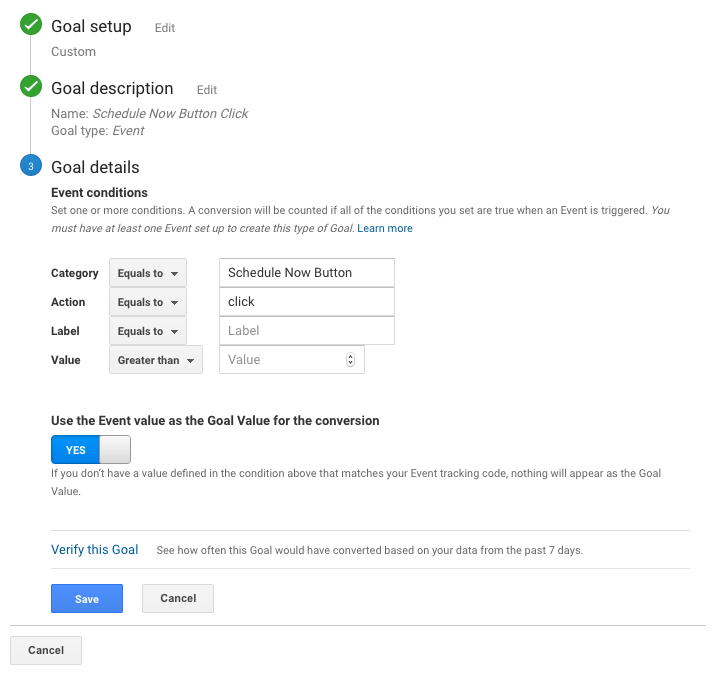 The easiest way to track button clicks within Google Analytics is to use “Goals”. Goals measure how well your site performs it’s objective, which in our case was getting users to click the “Schedule Now” button. When the user clicks the button, our Goal is completed; each time a Goal is completed (or performed), it is called a “Conversion”. There are many different types of Goals designed for tracking of specific events / user interactions, time spent on the site, specific pages visited, etc. For our button click tracking, our Goal will be of type “Event”, which is used to represent a single user interaction (i.e. the button click). Events are pretty flexible, and can be used to capture contextual information as well; here is more information about what all is possible with Events. The default Tracking Code snippet will include Analytics via the Google Site Tag, which is designed to streamline site tagging across multiple Google Products1. This is beneficial if you’re using other Google Services like Ads or Tag Manager. However if you’re only using Google Analytics, and prefer to minimize the number of HTTP requests when loading your site, you may want to include the Google Analytics snippet directly. Now that we’ve got Google Analytics included, the next step is to set up a Goal. This can easily be done via the Google Analytics Console. Head into the Admin section, then inside the “View” column, select “Goals”. At this point we’ll have the option to create a new Goal, or modify an existing; lets create a new Goal. First we will select “Custom” on the Goal Setup tab. Next we will give the Goal a name, and select “Event” as the Goal Type. While it is safest to include this snippet after the Google Analytics Tracking Code (to make sure the ga() function has been defined), one cool feature included with Google Analytics is the ga Command Queue Reference. This allows you to queue up Analytics ga() requests before the Analytics library has fully loaded (since the library is loaded asynchronously to help with site load time). This Command Queue is a pretty cool feature, and is an easy way for us developers to incorporate an asynchronous interface into any frameworks or libraries we’re creating. Once you define a Goal, Google Analytics will automatically add a “Goal Completions” chart to the Home Dashboard. You can also browse to the “Conversions” > “Goals” > “Overview” page for more charts about the Conversions on your site. Notice the different Dimensions listed on the bottom left of the reporting panel, specifically the “Source / Medium”. This gave us insight into which Acquisition method was working best for our Conversions (Organic Search, Paid Search, etc.). Introducing button click tracking onto our site with Google Analytics was straight forward and easy. The most difficult part was sifting through all of the analytics lingo during research (believe me, there’s a lot). Once we honed in on “Goal tracking”, and “trigging Analytics Events”, we were on the home stretch! Looking forward to working this functionality into future sites.